Christ Church Hall Great Ayton is extremely grateful to the European Agricultural Fund for rural Development and the LEADER Fund for their incredibly kind support throughout our Church Hall Renovation Project 2018. Welcome to our Newly Refurbished Hall! The Hall is available to book for both private functions and for public performances. An entertainment licence is held but a licence for the sale of alcohol must be obtained before bar facilities can be authorised (see below). This is our stunning new Coffee Lounge with a bar to serve your guests refreshments. Above is our fab new kitchen, equipped with larder fridge, dishwasher, hot water boiler and range cooker. We have an extensive new collection of crockery available for use too. The Hall does get booked-up quite quickly for functions, to avoid disappointment, make sure you contact us in good time to enquire and book! Friday evening bookings are now possible providing we have at least one month's prior notification. With a little imagination the Church Hall can be transformed for your perfect function. Pictured right is a recent RNLI Dinner Party (circular tables and candelabras were hired to give a touch of class). 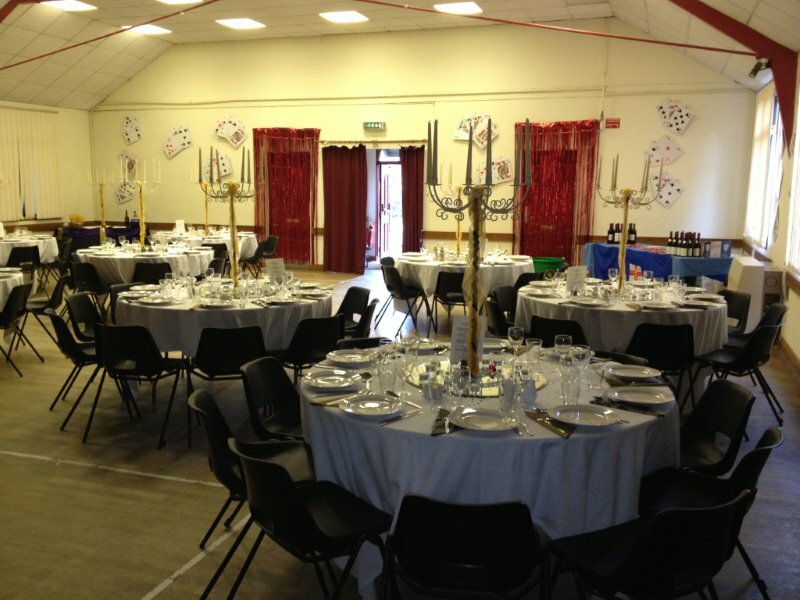 Wedding Receptions - The Church Hall makes a wonderful and affordable place to hold your wedding reception. Whether or not you hold your wedding at Christ Church the venue is available for all. We offer a package including exclusive use of the Hall and Coffee Lounge. The Hall can be made to look amazing and beautiful, all it needs is some artistic licence! Why not book our Hall on a Saturday or Sunday afternoon for your child's party? The main Hall gives ample space for games and bouncy castles whilst the Coffee Lounge can be set out for tea. Or perhaps we can be the venue for guests following your child's service of baptism that usually take place at 11.15am on Sundays. The charge is just £35. Please contact Sarah, in the Hall Office, if you are interested in the hall (but please see the Vicar first about the baptism - tel: 01642 -722665). The operating costs of the Parochial Hall are generally funded by receipts of Hall booking fees from regular and casual users and it is intended that these fees are both reasonable and competitive. In order to keep them so and to allow for improvements to the fabric and to purchase and replace equipment for the Hall, a '200' Club operates. Please see the '200 Club' for details. Wedding Functions - Price upon enquiry - exclusive use of the Hall & Coffee Lounge including set and tidy-up times. After-function clean - £60.00 (our lovely cleaners will come in the following morning to clean for you - for further details please speak to Sarah in the Hall Office). Baptism Teas and Children's Parties - £45.00 (two hour duration - Hall and Coffee Lounge included). Wedding Functions - Price upon enquiry (Terms and Condistions apply) - exclusive use of the Hall & Coffee Lounge including set and tidy-up times and post-event cleaning service. N.B. There may discounts available for charity functions - please enquire in the Hall Office. We have 6' x 2' trestle tables, round tables, square tables and chairs available for you to use for your function.